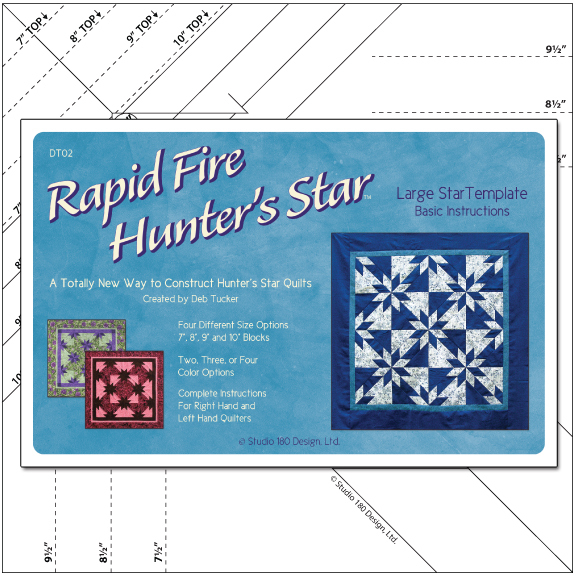 One of our most poplular classes this past year has been Rapid Fire Hunter’s Star. 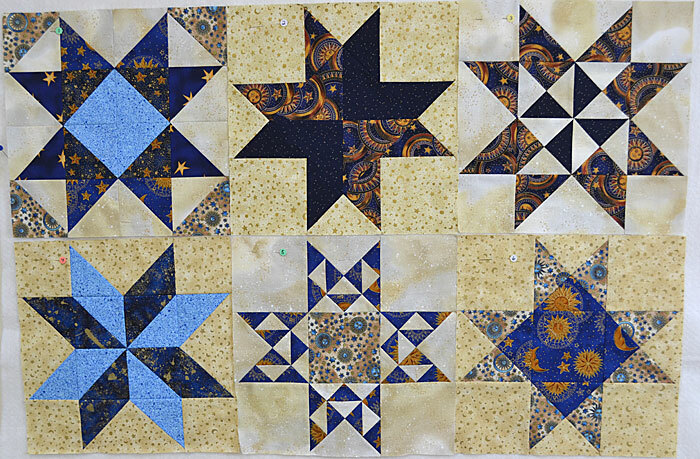 As many quilters know, this star can be a challenge to make. However, we have discovered a template/ruler that makes construction of this quilt easy – with no Y-seams or half-square triangles! The Petite size of this template/ruler has four different block size options: 5”, 6”, 7”, and 8”. You can do two-, three-, or four-colour options. The template has excellent basic instructions on how to use it, for both left and right handed quilters. The Large size of this template/ruler has four different block size options: 7”, 8”, 9”, and 10”. 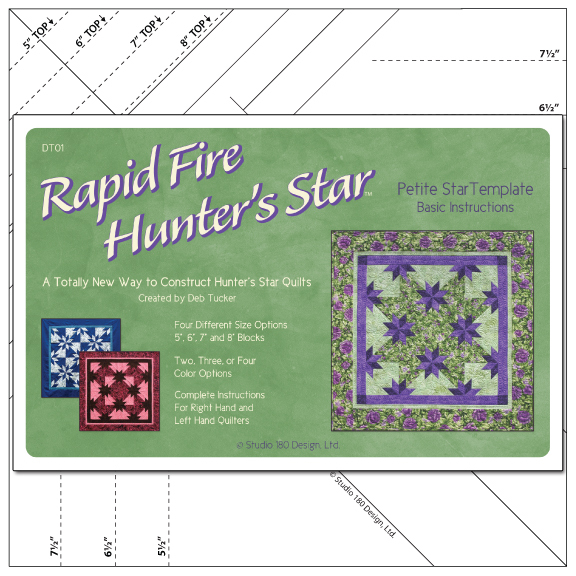 Again, you can do two-, three-, or four-colour options, and excellent instructions are included for left and right handed quilters. Our store sample was done with 16 different fabrics, using the 8” block of the Petite template/ruler. We have kitted this up in the center size of 64” X 80” and colours of the sample. There are sixteen .5 meter cuts of batik/bali fabrics. 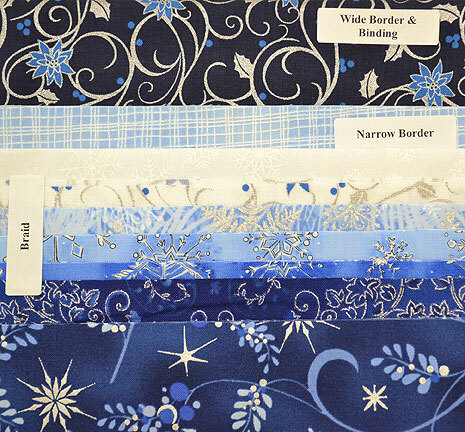 Border and binding are not included, but if you would like us to select a matching dark navy/puple batik border for you, we would be happy to do so. You will require 2.5 meters for this, and dependent on the width you make the border, you may be able to cut the binding from this as well. 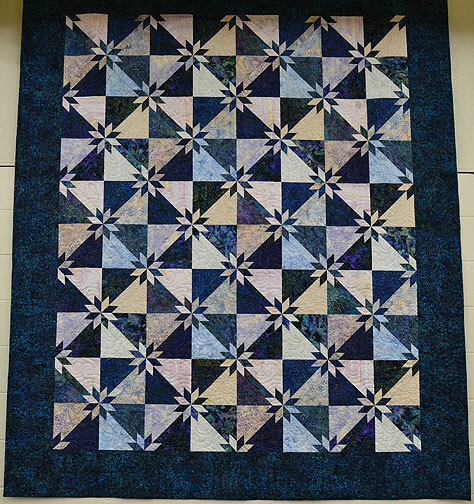 And if you would also like to take a class on making this quilt and live in the area, we have a new session scheduled for Mondays: February 13, March 12, April 16 and 30. Please feel free to call our store for more information. 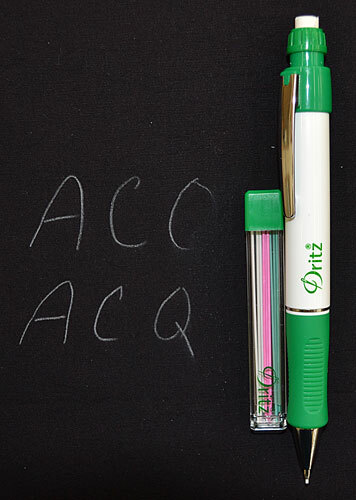 A couple of years ago the market came out with new mechanical marking pencils. There are many different brands of these pencils, and while some people get hung up on the “brand” name, they are all the same and each works just as well as the other – they just have a different name or colour stamped on the barrel. So we bring in the one that is the best price and must useful. That means at this time we are stocking the Dritz brand, as it comes with THREE colours of leads (instead of just white), which eliminates the need to buy other colours of leads separately. Ceramic leads are a sturdy .9 mm, meaning they are stronger and less prone to breakage than .5mm or .7mm. It is packaged with 9 extra leads: 3 each of white, pink, and green. Leads are specially formulated for fabric and are made from water soluble dyes (however, I would always pretest a coloured lead for washout ability on the fabric being used). It has a twist up-and-down eraser that really works – it doesn’t smudge across the fabric like a regular white eraser. Replacement leads and erasers are available. My favorite marking tool – it makes a precise, fine line to follow. If you live in the area, please feel free to try out the demo pencil. The most flexible gift of all is the gift certificate. The purchaser knows you’ll be able to buy what you need or want, in the colour/style wanted, when you want it. There are no concerns about buying something that is already owned or not wanted. The receiver is given an opportunity to buy their choice of a special item representative of the gift. 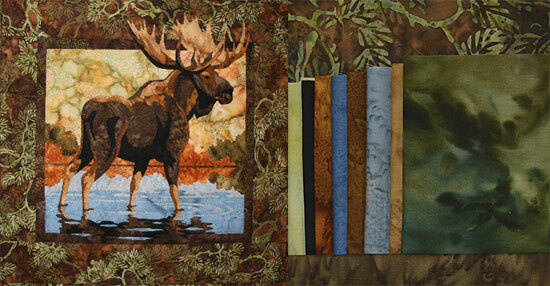 Many have used them for fabric for a special quilt they would like to make. Some people wait until they find the perfect kit. Come with an envelope, but could be slipped in a card. Can be purchased over the phone by credit card and mailed to the recipient. Actual postage cost will be added on to the charge. Are available in any amount desired. Are excellent for items such as books that are out of stock but can be ordered in. The purchaser could enclose a picture of the item that the gift certificate is intended for. Allow the receiver to make smaller purchases, and carry forward the balance for the future. They need not worry about spending an allotted amount at one time. Might this be the perfect answer to what you want for Christmas? Might this be the perfect answer to what to buy your quilting buddy? How about one that as you sew it together, you are also quilting it? Yes, in about 6 hours, you can be at the point of binding. We just finished a 6-hour class on this and all the students are now binding. And one of them was back in the store for fabric to make a couple more. 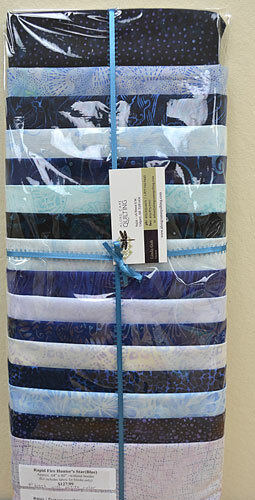 It is one of our most popular table runner kits, as it works up quickly and is very impressive. The Holiday Braid runner finishes at approximately 17” X 52”. 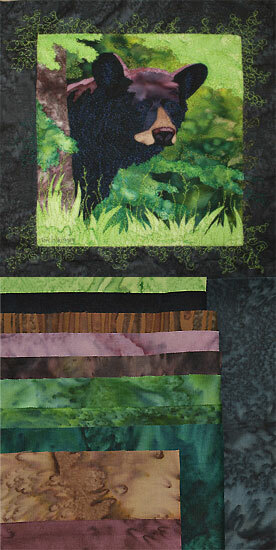 All kits include the fabric for the top, binding, and backing. 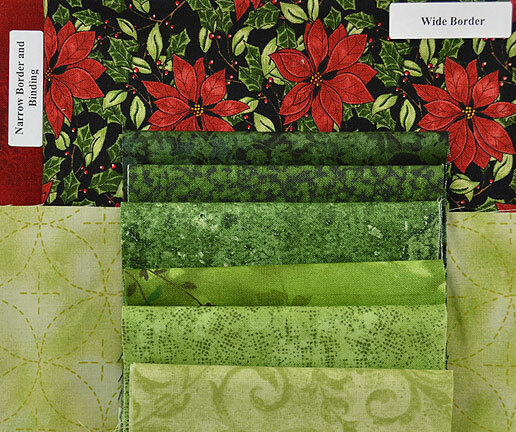 We also have these kitted in Christmas fabrics. I used to make little fabric newts (lizards). These started out as toys for my kids and quickly morphed into a home craft business where I was selling them as fast as I could make them. They were about 9” long, with the body only about 5”, and had 4 little fingers per hand. I became a master of turning little things inside out. And there was only one way I could manage to put these out in the hundreds. It was a tool called the Turn-it-All. It is also known as a Bow Whip. This tool is also used for turning purse handles and spaghetti straps inside out. The package contains 3 sizes of tools, and you select the size dependent on the project. How rare is it that once you’ve laid your blocks out on the design wall or the bed or the table, you get to sew them all together right away? Not often, right? So then you either use tape or pieces of paper with a numbering system to keep track of the placement of the block within the quilt design, so you can store them away. First of all, don’t use masking tape. You would be shocked at how fast the glue can permanently adhere, mark, and ruin your block. Don’t go thinking it won’t happen to you, because I’ve seen it occur. If you use a green painter’s tape, I suggest the brand Painter’s Mate sold at Home Depot. I’ve had another green painter’s tape take the finish right off of my laminate desk when used for moving. It hadn’t been on for more than a day. So now that you are good and leery about using tape for this purpose, you might be eyeing the post-it notes or scrap paper. Now while paper notes are wonderful, you have to pin them on. 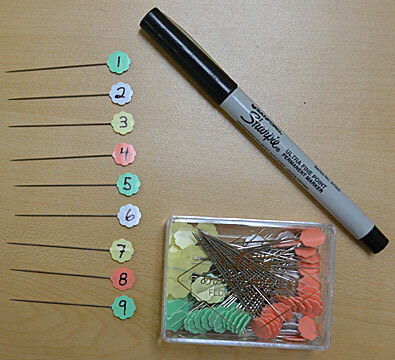 So I’ve eliminated the paper part of the equation, and just use marked pins. I took a box of Clover Flower Head pins, and with an Ultra Fine Point permanent Sharpie (available at stationery stores), I consecutively numbered as many as I had blocks in my quilt. Then when I laid out my blocks on the design wall, I used the appropriate numbered pin for the placement of the block. I always put my pin in the upper left-hand area of the block, but well away from the seam allowances. 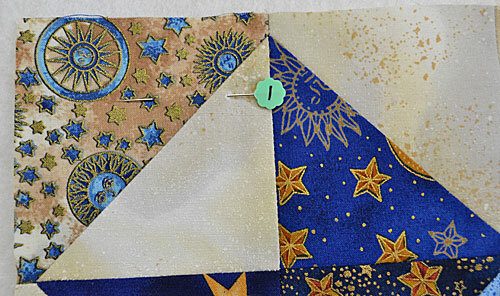 I want to keep the pins in the block as I sew, and by being consistent with their placement, it helps me not get the blocks turned around between the design wall and the sewing machine. I don’t want to sew the wrong edges together. By having a consistent plan with the layout of your pins, and double checking them when going to sew the blocks together, you won’t have to rip out seams. When your quilt top is sewn together, remove the pins, and put them in a separate pincushion all numberically lined up like soldiers waiting for duty. The next time you need to arrange your blocks, they will be ready for use. No fumbling in a box, trying to find them in the right order. 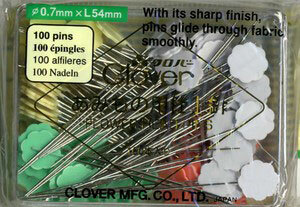 We sell the Clover brand of Flower Head pins. After trying out many brands here at the shop, these were the ones we found to be the sharpest and strongest. You don’t want a pin that is dull and creates a hole in your fabric. We affectionately call pins like that “nails”. Each pin is 7mm wide by 54 mm long. The flowers are plastic and heat resistant only – do not apply the iron directly on the flower head. No brand has flower head pins made of glass. Three years ago we featured this product, and it was a hit with our customers. So I was very disppointed when the company discontinued selling it. But lo and behold, one of our distributors must have bought up the last of the stock, because I was able to order them! The bag measures 20” X 25”. It has an adjustable, removable strap so you can put it over your shoulder, as well as handles. The inside zippered compartment holds a mat up to 18” X 24”. You can also put your project or fabric in it. The front of the bag has 2 small pockets for cutters, scissors, pens, pencils and the like. It also has a 12” X 12” zippered pocket for holding wider supplies or blocks. At the bottom of the front is a pouch for a 6” X 24” ruler closed with a hook and loop fastener. The back of the bag has 2 separate pouches which will hold a 15.5” square and a 12.5” square. The pouches have depth to them, so you can get more than one ruler or item in them. When they are gone, they are gone. I can’t reorder them. There you are at the table, excited about your new quilting project. You’re pressing down on your ruler, holding it the way you’ve been taught, and for the first part of the cut everything is going well. But just as you approach the last third of the cut, the ruler moves and your cut is off. The air turns blue, and your moment with your project just isn’t as fun anymore. Unless your ruler has a non-slip surface built in, most rulers and templates slide around on top of the fabric. After 16 years of quilting, I still cannot make a straight cut with a ruler that doesn’t have a non-slip surface, so don’t beat yourself up on this being a user error. In order to remedy this problem on rulers and templates, I have used Invisigrip, which is a clear plastic film you apply to the ruler, and sandpaper dots. With the former product I find the plastic obsures visibility somewhat, and with the latter, I’ll just tell you: oak table + sandpaper dots = ruined table top. There is a new product out on the market now, that our customers and staff have been loving and is our “Hot Dang” product of 2011 and of the 12 Days of Wishing. 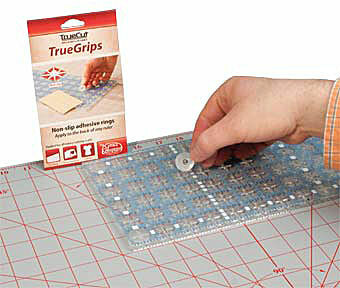 While we still carry Invisigrip, we find most customers prefer this and will choose it instead: TrueGrips – helps you Get a Grip!! Aren’t we quilters a fickle lot! But when we are free-motion machine quilting, we want the quilt to easily glide across the surface of the machine. 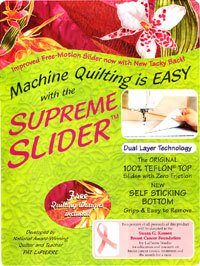 There is a product on the market that many quilters love called the Supreme Slider. It is made of teflon, and has a self-sticking bottom that attaches to your machine bed. The slick surface allows the quilt sandwich to move easily. Three steps to using the product: Attach your free-motion or darning foot to your machine. Lower your feed dogs. 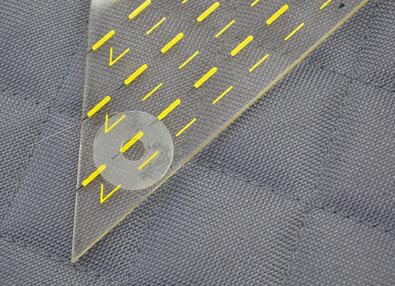 Position the supreme slider on the sewing bed with the needle centered in the pre-punched hole. 8″ X 11.5″ size. Will fit any machine, and, if necessary, can be trimmed with scissors. 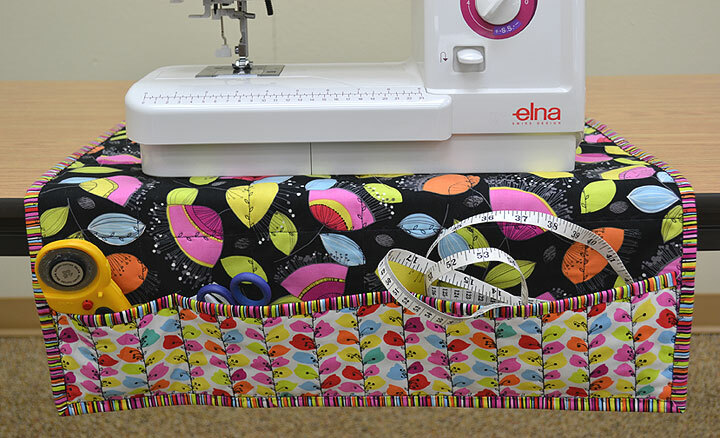 The Sew Happy sewing machine mat kit not only protects your table, but has pockets so your tools will be easily accessible. Kit includes pattern, and fabric for making the mat (front and back), including the binding. Pattern also has instruction for pin cushion and mini iron-boards. Were seated by my side. But I’ll soon be back for more. I’ll soon be on my way. There are car decals in today. It shows “I love to Quilt!” Oh Yeah!! 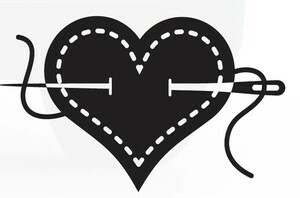 “I Heart Sewing” decal measures approximately 6” X 3.5”. “I Heart 2 Quilt” decal measures approximately 6” X 4.5”. Shown in black for easier viewing, but sold only in white. What a rack, eh! And taking a skinny dip! It might be in the lake of your husband’s dreams. Hidden Lake kit includes pattern by Toni Whitney, and labelled fabric for top and binding (shown on the right). Backdoor Bear kit includes pattern by Toni Whitney, and labelled fabric for top, backing, and binding (shown on the bottom of the picture). Approximately 14” X 16” or 8” X 10” if mounted on canvas. 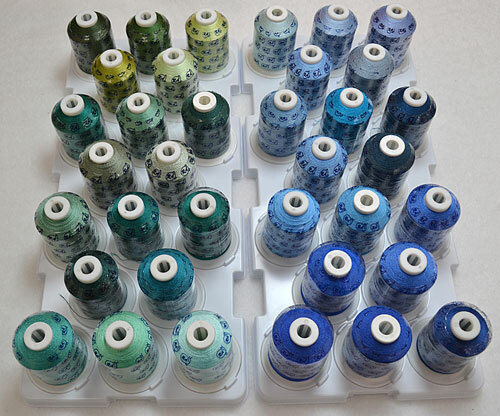 Do you have your mini-king embroidery spools all loose in a box? Are you fed up with knots and digging through the spools trying to find the right colour? After years of requests for a storage solution for the Robison-Anton Rayon mini-king 1100 yard spools, we think we’ve found a winner! 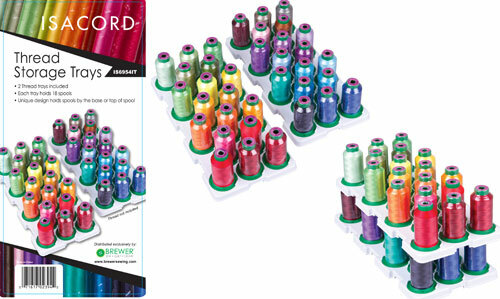 And if you don’t use Robison-Anton, they also work for Isacord embroidery mini-king spools. 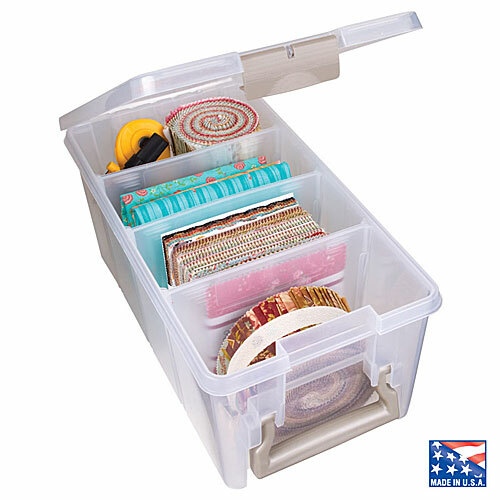 These thread storage trays come in a package of 2, with each tray firmly holding 18 spools. The spools clip in to the tray, so there is no way they will fall out. You could turn them upside down and thumb your nose at gravity. Dimensions are 12.5” X 6”. Each package of 2 trays is $19.99. 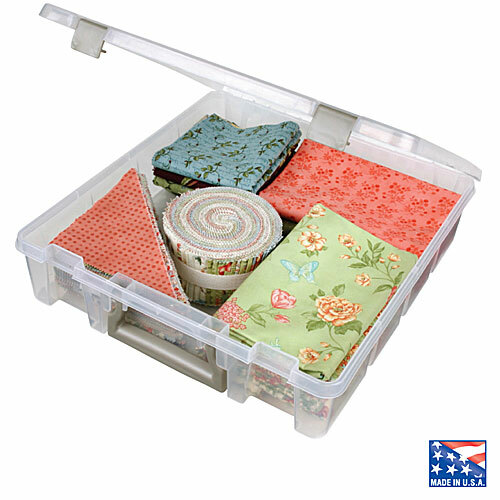 You could use these thread storage trays in dresser drawers or other storage cabinets. But, like many people, you might fall in love with the Art Bin Super Satchels. They are portable, and customers also love them for storing their projects, blocks, notions, etc. They are stackable, come with a handle, and are acid free. There are 3 sizes we currently have in stock. Use the Super Semi-Satchel open core, or with the 3 dividers it comes with. 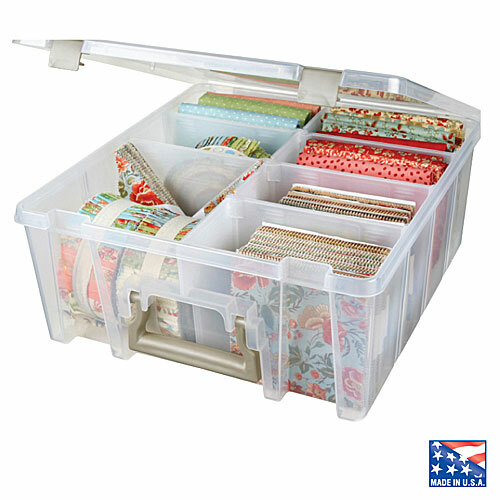 One Super Semi-Satchel will hold 2 of the thread storage trays (1 package – 36 spools). Use the Super Satchel 1-Compartment for your projects. It will hold 12.5” squares/blocks. One Super Satchel 1-Compartment will hold 2 of the thread storage trays (1 package – 36 spools). 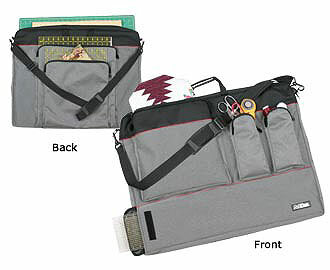 Use the Super Satchel Double Deep for larger project storage. It can be used open core or customize up to eight compartments for multiple storage options. It will hold 12.5” squares/blocks. One Super Satchel Double Deep will hold 4 of the thread storage trays (2 packages – 72 spools).